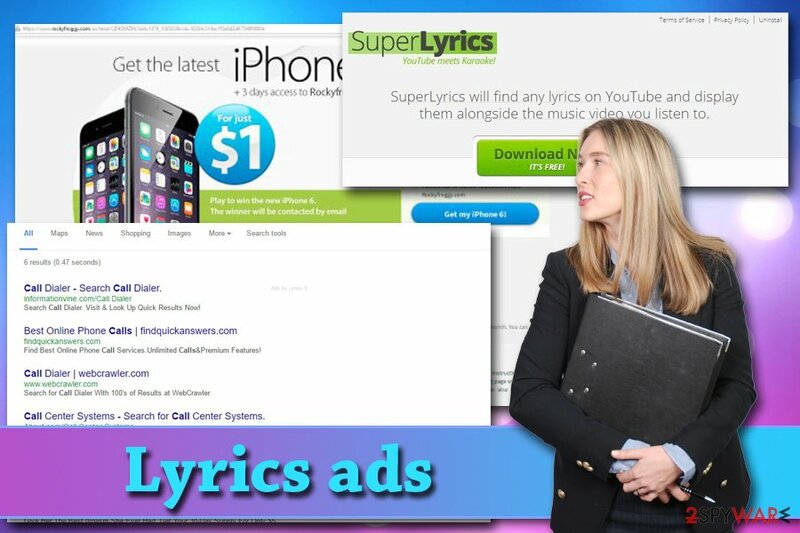 Lyrics adware is a set of potentially unwanted applications that are designed to find and display song lyrics on various platforms, such as YouTube. In theory, it sounds like useful tools, but the practice shows that applications like these usually have some nasty tricks up their sleeves. An adware fills Google Chrome, Internet Explorer or Mozilla Firefox browser with ads which pop-up on every website users visits. While adware diminishes browsing experience greatly, it is not the main dangerous feature of it. Alternatively called as Ads by Lyrics, popups can sometimes link users to unsafe sites, such as scam, phishing, or even malware-laden ones. Lyrics adware can be downloaded from various websites filled with advertisements, although most prominent distribution method of these applications is software bundling. This deceptive marketing routine is practiced all over the world and is extremely effective. If you did not pick Advanced settings during software installation, expect to find PUPs on your computer. In such case, read on and learn how to remove Lyrics virus for good. Although all of these applications might visually look slightly different, they all have the same functionality and one goal. Adware developers try to lure people by offering them useful feature (displaying lyrics), which is allegedly free. However, the primary purpose of such PUPs is to direct Internet traffic to specific websites when users click on them, exploiting the so-called Pay-per-click (PPC) principle. Unfortunately, Lyrics ads authors do not check the content they link users to. Therefore, they might end up on dangerous domains. Phishing web pages allow survey or tech support scams to thrive, and adware developers do not care, as long as they receive their money. Unfortunately, the end user might end up being scammed. This can lead to personal information disclosure, money loss, or even identity theft. The data is collected in order to display personalized adverts, which increases the chances of users buying from sponsors. It is a well though-our scheme. Sadly, it only benefits adware developers, which the end user has to deal with an annoying pop-up, banner, deal, offer and coupon spammer, that can also inject browser extensions, toolbars and other useless apps without permission. 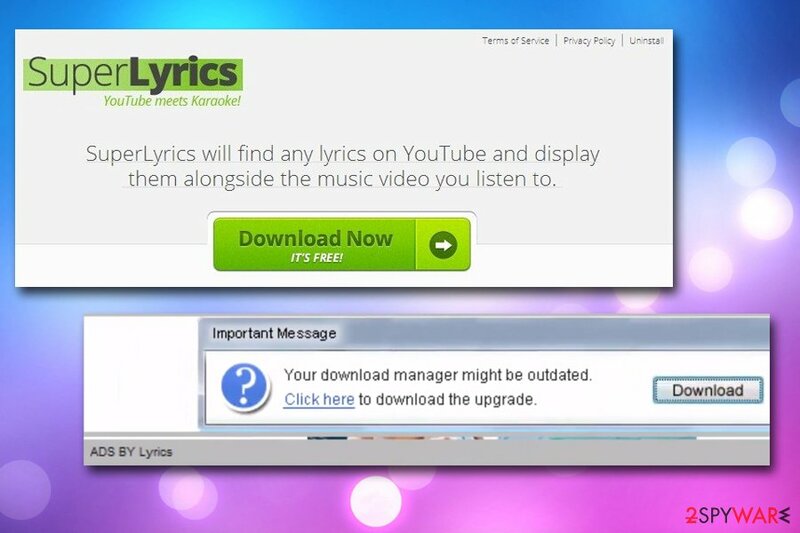 Therefore, we advise users to uninstall Lyrics ads as soon as possible. You can either use our detailed instructions below or opt for an automatic elimination. For the latter, we recommend using Reimage or any other reliable security software. In most cases, adware infiltrates computers in a bundle with free software that users download on the internet. These bundles are usually distributed by third-party download managers. Therefore, to avoid the unpleasantness of removing PUPs from your computer, prevent it instead. Be very attentive when downloading and installing free software. Check each of the installation steps, especially “Custom” and “Advanced” options and deselect everything that might seem unfamiliar and unrelated to the application you want to install. Secondly, download applications from their original websites rather than through third-party installers. This will reduce the risk of potentially unwanted programs entering your computer. While it might seem easy to remove Lyrics virus with some default program manager, we would highly advise using specialized tools like Reimage or Plumbytes Anti-MalwareMalwarebytes Malwarebytes anti-malware, which will scan your computer and determine whether there is no infiltration of other programs that could have been secretly installed on your PC. If you are entirely confident that your device is virus-free, though, you may try to carry out Lyrics adware removal manually, using the guidelines we provide below. Nevertheless, security experts remind that you can never be too careful, so after you are done with the virus extermination, make sure you refresh each of the installed browsers. Lyrics virus is primarily oriented towards Windows operating systems, so we have prepared a guide which will help you get rid of the virus below. Please keep in mind — the PUP you are looking for in your program's list is probably labeled something completely different than Lyrics, to obfuscate the virus removal. So, stay attentive and inspect any suspicious and unfamiliar programs that you find on your PC. Wait until you see Applications folder and look for Lyrics or any other suspicious programs on it. Now right click on every of such entries and select Move to Trash. If adware operates on the computer for an extended period of time, it is likely to install some additional components on the browser to help it deliver more ads and inject more sponsored links. Thus, you should eliminate all of such components from your browser without delay. You can do that by going to the Microsoft Edge menu and selecting the “Extensions” catalog. To get rid of Lyrics adware from your device and its ads from the browser entirely, you should pay attention to the additional components that may have been installed during the adware's stay on your PC. If you find that you did not install them yourself and they demand unjustified permission, delete them unhesitatingly and reset your browser. ^ Ellen Zhang . WHAT IS ADWARE? HOW IT WORKS AND HOW TO PROTECT YOURSELF AGAINST ADWARE. DigitalGuardian. Analytics platform. ^ What is identity theft?. Which. English magazine. This entry was posted on 2018-08-03 at 03:28 and is filed under Adware, Viruses. You can quickly scan the QR code with your mobile device and have Lyrics ads manual removal instructions right in your pocket.